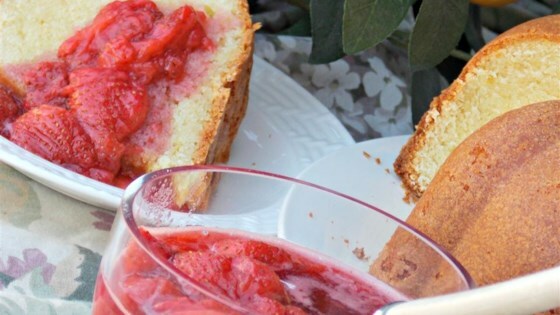 "This strawberry topping is perfect for strawberry shortcake. Adjust the sugar depending on how sweet your berries are." Combine strawberries with dark corn syrup in a saucepan over medium heat, bring to a boil, and reduce heat to low. Stir until mixture simmers and strawberries give up their juice, about 10 minutes. Remove from heat and stir in sugar and lemon juice until sugar has dissolved. Let cool to room temperature and chill before serving. Discover Chef John's family recipe for this iconic summer classic. I tried this with angel food cake and topped it with a mixture of cool whip (16oz) and cream cheese (8oz). The flavors blended well. I didn’t care for the taste of this at all. My kids liked it but I wouldn’t use this recipe for strawberry shortcake again. Man, that's GOOD! Thanks for sharing!! Made exactly as stated. And this is delicious. I will use this from now on for topping my shortcake with. Thank you so much for this recipe. I thought it would be better with molasses rather than the corn syrup. Made it as recipe instructed. Very good.